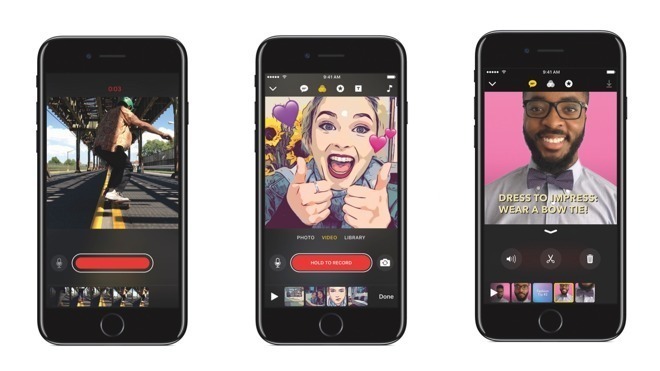 Apple's social media minded video creation app Clips was downloaded between 500,000 and 1 million times, according to App Annie estimates, though the title has yet to crack the iOS App Store's top 20 list. App Annie statistics show Clips achieve its highest ranking — No. 28 on the App Store — a day after the app launched last Thursday, reports TechCrunch. Despite an aggressive advertising push and a prominent banner ad at the top of the App Store, interest in Clips is quickly ebbing. The app slipped to No. 39 in the U.S. App Store on Saturday and reached No. 40 on Sunday. Clips stands in the No. 69 spot on the Top Charts for free apps as of this writing. The estimates beat Apple's Music Memos app debut last January, according to metrics from App Annie and Sensor Tower. The app, designed for on-the-go music creation, reached the No. 29 spot over its first four days of availability. In addition, the two firms confirmed Clips' week one performance trumped that of Music Memos in terms of outright downloads. Diving deeper into App Store metrics, the U.S. is Clips' largest market with a 25 percent share. China comes in second with about 16 percent, followed by Japan, Russia and Hong Kong. Clips launched last week as Apple's first content creation tool focusing on social media dissemination. As AppleInsider noted in our first look, the app's streamlined interface and unique features, like integrated dictation with Live Titles, proves useful in generating slick videos for sharing. That said, the included filter set, sparse selection of overlays and clunky share sheets integration can be considered a bit wanting when compared with competing apps.